Traditional approaches to ecological land classification (ELC) can be enhanced by integrating, a priori, data describing disturbances (natural and human), in addition to the usual vegetation, climate, and physical environment data. To develop this new ELC model, we studied an area of about 175,000 km2 in the Abies balsamea–Betula papyrifera and Picea mariana-feathermoss bioclimatic domains of the boreal forest of Québec, in eastern Canada. Forest inventory plots and maps produced by the Ministère des Ressources naturelles du Québec from 1970 to 2000 were used to characterize 606 ecological districts (average area 200 km2) according to three vegetation themes (tree species, forest types, and potential vegetation-successional stages) and four sets of explanatory variables (climate, physical environment, natural and human disturbances). Redundancy, cluster (K-means) and variation partitioning analyses were used to delineate, describe, and compare homogeneous vegetation landscapes. The resulting ELC is hierarchical with three levels of observation. Among the 14 homogeneous landscapes composing the most detailed level, some are dominated by relatively young forests originating from fires dating back to the period centered on 1921. In others, forest stands are older (fires from the period centered on 1851), some are under the influence of insect outbreaks and fires (southern part), while the rest are strongly affected by human activities and Populus tremuloides expansion. For all the study area and for parts of it, partitioning reveals that natural disturbance is the dominant data set explaining spatial variation in vegetation. However, the combination of natural disturbances, climate, physical environment and human disturbances always explains a high proportion of variation. 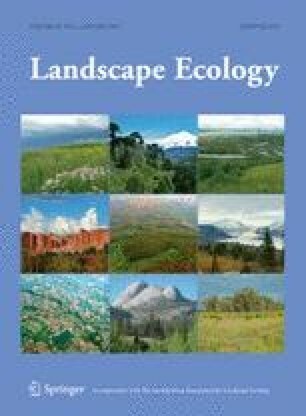 Our approach, called “ecological land classification of homogeneous vegetation landscapes”, is more comprehensive than previous ELCs in that it combines the concepts and goals of both landscape ecology and ecosystem-based management. The online version of this article (doi: 10.1007/s10980-013-9961-2) contains supplementary material, which is available to authorized users. Data (plots, maps, archives) used in this study were collected by the staff of the Ministère des Ressources naturelles du Québec (MRN) between 1970 and 2000. This study could not have been produced without the effort of many individuals. Comments by Yan Boucher, David T. Cleland, Paul Jasinski, Jason Laflamme, Del Meidinger, Germain Mercier, 2 anonymous reviewers, as well as stylistic revisions by Debra Christiansen-Stowe, Karen Grislis, and Denise Tousignant were all greatly appreciated. We would also like to thank Denis Hotte and Véronique Poirier for their assistance in data analysis and geomatics. This study was funded by the MRN.